How do I use the FGameplayTagContainer and Tag Editor? Is it finished ? The editor part seem lack of the ability to actually add tags. Or tags are added by other means. If so, how ? Did someone managed to use gameplay tags? We managed to import them and see them in BT nodes, but no idea how to add them to actors. Almost two years later. No updated info anywhere on if or how Gameplay Tags work? This allows tags to be created in the editor and saved to an ini file, DefaultGameplayTags.ini. The other option is to import them from FGameplayTagTableRow data tables. This is harder to setup though and I think the .ini approach is superior. With ImportTagsFromConfig enabled, you should be able to add tags directly in the editor. Edit -> Project Settings -> GameplayTags. You can also add or remove them inline when editing a GameplayTag or GameplayTagContainer property. Tags themselves are very generic and can be used for a lot of different things. The basic idea is that they are strings with a hierarchical relationship. E.g., they can have a parent. An example tag would be "A.B.C" or "Damage.Physical.Pierce". That is really all tags are themselves. They hold no other data on their own. There is functionality for querying tags. For example, you could say something like "If I take Damage.Physical. * damage, do X". Which would match on Damage.Physical.Pierce but not Damage.Magic.Fire. Tags can be dealt with individually (FGameplayTag) or in containers (FGameplayTagContainer). So for example, you could have a container describing a spell and then write a query that, by looking at the spell's tag container, acts on "spells that have Damage.Magic.Fire AND SpellRange.AOE tags". They can describe GameplayEffect assets ("This will set you on fire"). They can be granted by GameplayEffects to things with Ability System Component ("This person is now on fire"). They can be used to specify requirement for activating abilities (E.g, must not have "Status.Fire" to activate the ability). They are used to invoke GameplayCue events (which do cosmetic, client side things like spawn particles. E.g, GameplayCue.Fire). In Paragon we also use them for very specific Paragon things. We tag our heroes with tags in order to see what roles or affinities they can use. Can you at least describe the import process using FGameplayTagTableRows? Also, is there any way to limit the scope of the tag editor to a specific set of parent tags via metadata? Obviously there's manual filtering, but this doesn't allow programmers to limit the scope of what tags 'should' be used to designers. This thread is literally the only documentation for using Gameplay Tags whatsoever. Does this mean we probably shouldn't be utilizing them, as they're not fully supported? I like the hierarchical set up of this system and the ability to set-up well-defined per-project tags that are centralized, but we could probably develop a similarly capable system if it's not fully online. Sorry for the confusion guys - GameplayTags are a separate, unrelated system to Actor Tags. GameplayTags is a more advanced/robust system but requires data assets to populate the tag lists. We haven't written any docs or tutorials on GameplayTags yet. To create tags in the editor you need to import them from a CSV file. They cannot be edited/created directly in the editor (for now at least). To import from a CSV, you need to right click in the content browser and select import, then locate a .CSV with tag data (see below), select DataTable -> GameplayTagTable. Here is an example for the GameplayTagTable format. Internally we use Excel to maintain these tables and export them as CSVs with macros. Again this is stuff our game teams have been using but not really a feature of the engine that has been given much polish for outside consumption. Over time we expect this to evolve into a more user friendly system. Save that into a .CSV - you should be able to import it into the engine. This needs to be done at editor startup too... so the correct way is to make a UEngine subclass for your game. But that is a lot of steps. It is probably easiest to stick the above line somewhere in UEngine::Init. Thanks. That means I have to build engine from source ? Not an big deal for me, but seems bit daunting to put such specific game thing, this high in engine hierarchy. In any case I started using this module, for my project and I must say it is extremely useful I love it. Would love it even more if the ability to add tags was easier, preferably directly in editor (:. Yeah, future versions will make this easier. Technically you don't need to build engine source - you can subclass UEngine and UEditorEngine in your project and do your dictionary loading in UYourGameEngine::Init(). The problem isn't trivial since the global dictionary needs to be loaded before your game assets try to load (or rather, the dictionary needs to be specified since references to tags in your dictionary only store the index into the dictionary, not a reference to the dictionary itself). As this system was brought up in our projects which already had their own UEngine/UEditorEngine subclasses, it was easy to specify the global dictionaries there. For smaller team projects where they won't need to their own engine subclasses, we will need to find a better way of loading the global dictionary. Edit - Index is actually wrong. I believe tags are stored as text but they need to resolve to a stable index independent of load order. A solvable problem in many ways, the easiest being right now to specify a dictionary before loading any. I downloaded new preview build (4.2) and tried to to actually include GameplayTags in GameEngine.cpp Init function. But seems like I have trouble to get it working.I tried adding "GameplayTags", in Engine.Build.cs in various places (DynamicallyLoaded, Private, Public), As well ad adding public and private IncludePaths. Could explain in few words what's wrong ? And the file is in Intermediate folder. Can you try just adding "GameplayTags" to the PublicDependencyModuleNames array? I am not an expert on the UnrealBuiltTool chain. Its a very odd problem though. The intermediate directories should be auto included. If the above doesn't do anything I will get someone with more UBT knowledge to help. When I add it to PublicDependencyModuleNames I get huge list of unresolved dependencies, and it don't it even start compilation. Err yeah, that is probably introducing a cyclic dependency. Sorry, I've never set up a project like this. You may need to subclass UEngine for your project. I can noodle with this a bit if I get time this weekend, or you may just want to wait until this is a more polished/complete module. It would nice if you could post crash course to what is needed to implement custom engine class. Which functions to overload and how to get the custom engine class load. From that point I should be able to just rewrite engine class from source. It's not pressing, but I'd really like to get it working. In any case thanks for your help! Ok My previous issue is solved. I managed to override engine classes. Wasn't that hard after all, I just specified wrong paths to classes in DefaultEngine.ini in my project. But it seems like It doesn't work. I have debugged it and it seems like LoadGameplayTagTable, can't find my table. Is there anything special, about where that data should be stored, or how should I specify path to it ? Hm it seems, like tags are not loaded. I fallowed debug, and function is fired, but it seems it can't resolve the path for asset and do not read tags from file. Unless it is intended behavior that tags do not show up, when I click Edit button in editor ? 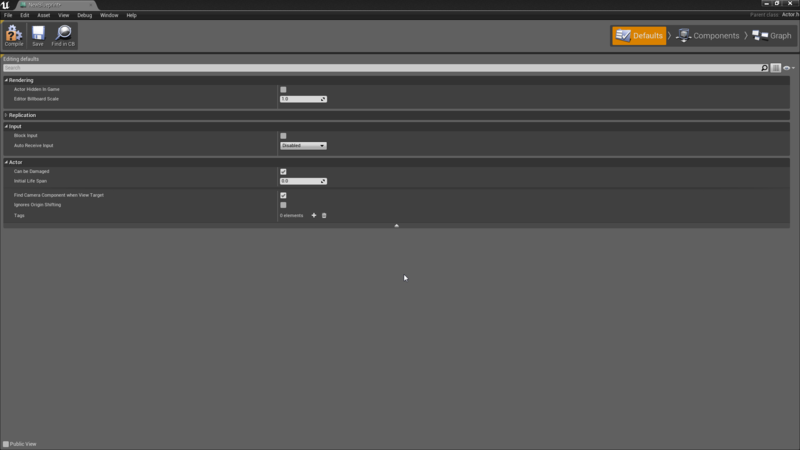 After re importing assets, tags show, in the tag editor. So I guess it is bug. Hey I repoen the issue. As of version 4.3 (the preview release from github), the tags are still not loading on startup. And tags are not loaded upon editor startup. The workaround I'm aware of for now is to, manualy reimport tags table, so they get loaded properly. I wonder if there has been any changes to this gameplay tags system? I noticed you can now create Data Tables directly in the editor (rather than importing a csv file), but it still seems overly complicated to get those Data Tables loading into Gameplay Tags. I didn't manage to extend UEngine and UEditorEngine (actually, I couldn't get the engine to use my extended classes rather than the default, even after changing DefaultEngine.ini). Trying to modify from source directly now. I need this for behavior trees: the Run Behavior Dynamic task requires Gameplay Tags. How can I add GameplayTag to an Actor? I cant find any interface or function to actually do that. Actors should have Tags array that is accessed via C++ and blueprints, i believe. You can add tags via Defaults tab in blueprint editor or inside Details panel by going to Actor category and expanding it, you'll see the same Tags property. I can't seem to add tags to an asset unless it's actually ON the map - is it possible to add tags to a static mesh or the like even if it's not on the map? I'd like to be able to do that so I can check for these tags when manipulating the object in a construction script. Possible to hardcode image references in blueprint function library?